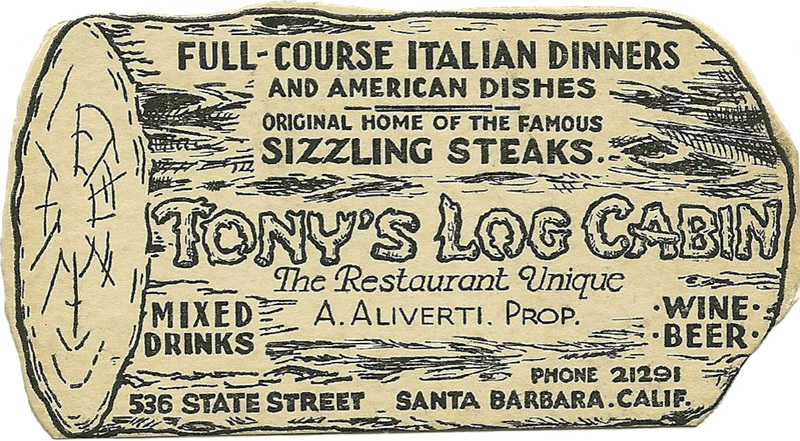 Restaurants began using business cards back as far as the 1840s, but most of the early ones in the antiques and collectibles market date from the 1870s and 1880s. 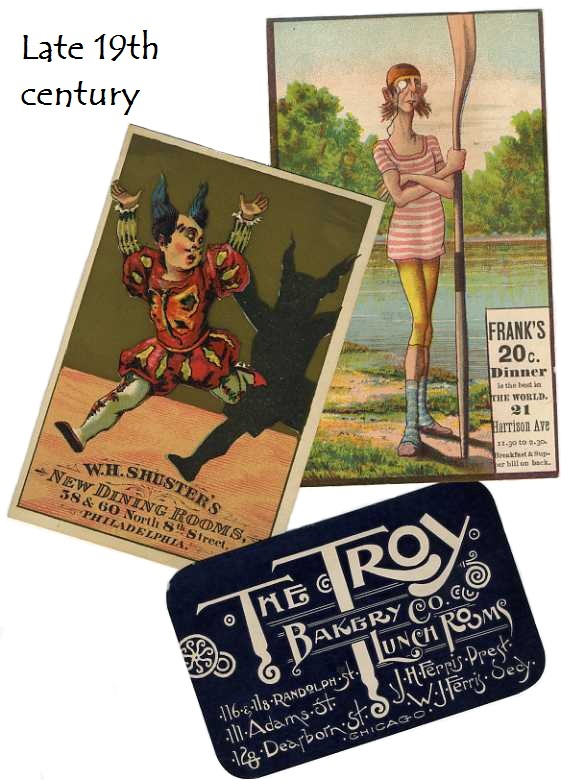 Although they are referred to as Victorian trade cards that people saved in scrapbooks, they are essentially business cards that give the restaurant’s name and address, sometimes with a short menu on the back side. I present here some of my favorites, from the late nineteenth century up to today. [above, a ca. 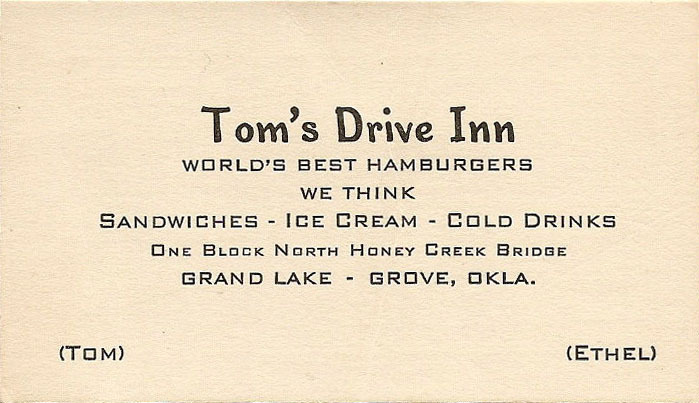 1950s die-cut card] These are some good ones “we think” (see Tom’s Drive-In below). The Senate Cafe, ca. 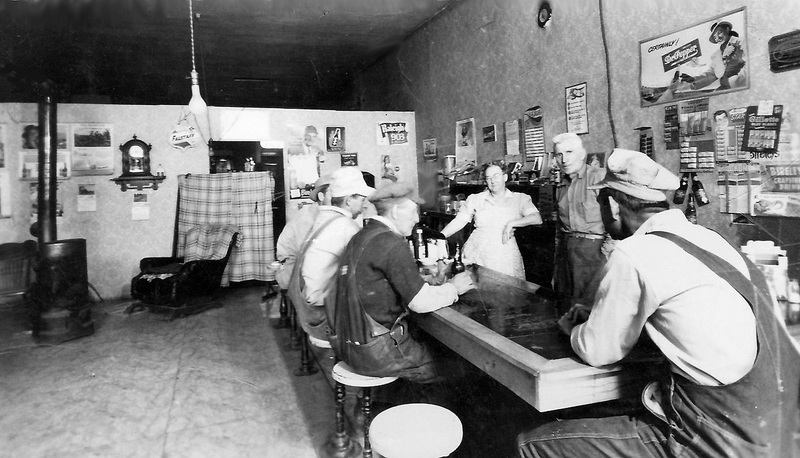 1915, was almost certainly a drinking spot first and foremost but the dour Mr. Smith probably provided the boys with light refreshments too. 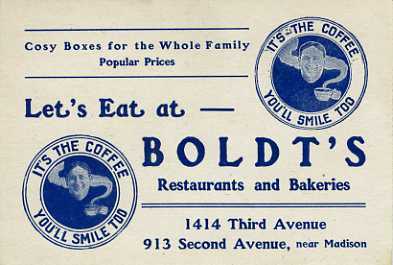 — From around the same time or a little later, Boldt’s, Seattle. The “Cosy Boxes” were for baked goods to take home. Below: cards I’ve picked up in recent years. 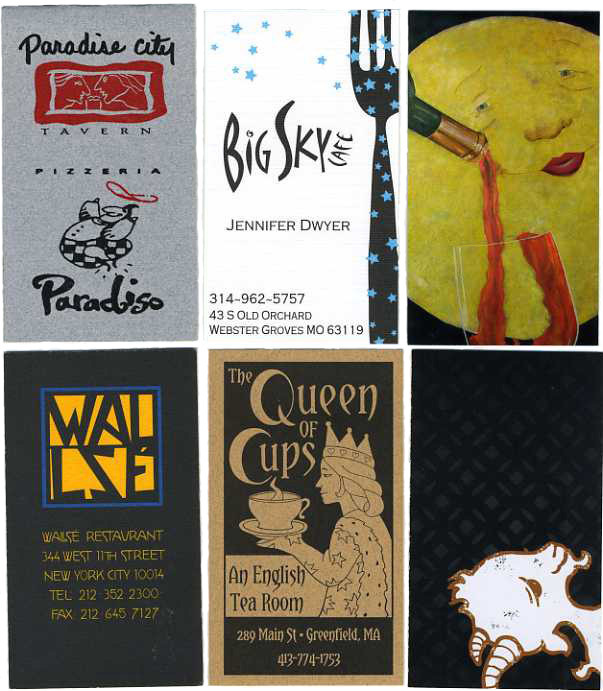 Clockwise from top left: Northampton MA; Webster Groves MO; City Cafe, Rochester MN; Girl & the Goat, Chicago [turned on end to fit]; Greenfield MA; NYC. 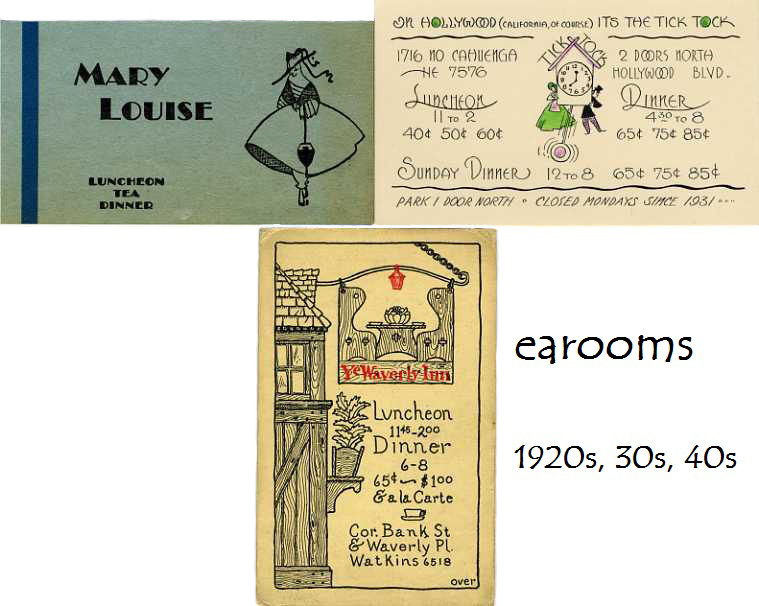 People liked to say that the names of lunch room chains in the early 20th century offered a lesson in geography. There were Baltimore, Boston, Buffalo, Chicago, Denver, Detroit, Hartford, Iowa, Manhattan, Maryland, Milwaukee, New York, Pennsylvania, Pittsburg, St. Louis, and Utica Lunches, or Dairy Lunches as some were known. 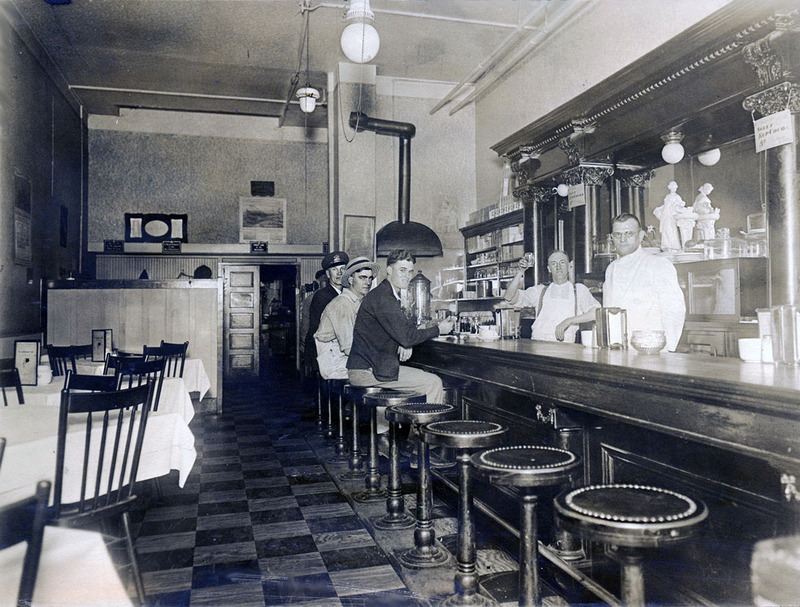 Los Angelenos patronized a New York Lunch in 1905, while customers in Duluth MN, Lexington KY, and San Francisco enjoyed their sandwiches in a Boston Lunch. Detroit had its Manhattan Lunch, while Manhattan had a Detroit Lunch. And so on. But before the 1920s no lunchroom chain was as popular as the Baltimore Dairy Lunch which at that time outnumbered Childs. 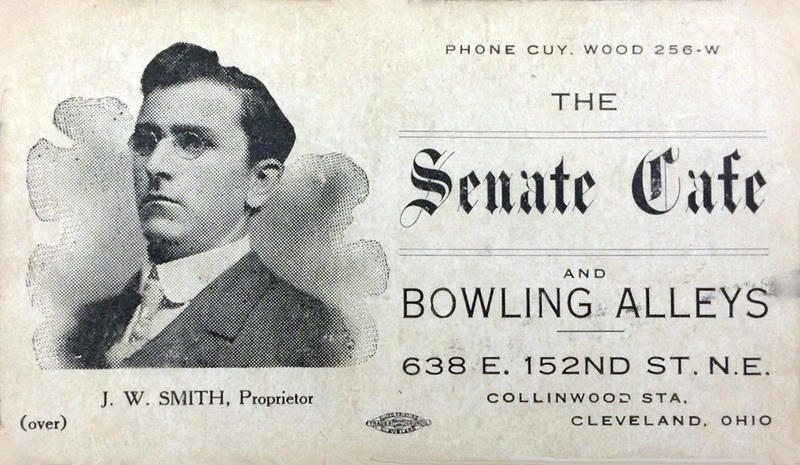 Founder James A. Whitcomb began the business in the late 1880s in Washington, D.C., where he was a federal postal clerk, then opening a lunch room in Baltimore. Along with four quasi-franchisers, he controlled about 140 units by 1920. The largest branch, under the ownership of Harry Bowles in Springfield MA, consisted of a couple dozen units. 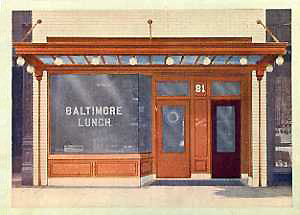 Few large cities were without a Baltimore Dairy Lunch, as Whitcomb’s were named, or a Baltimore Lunch, the name used by Bowles. 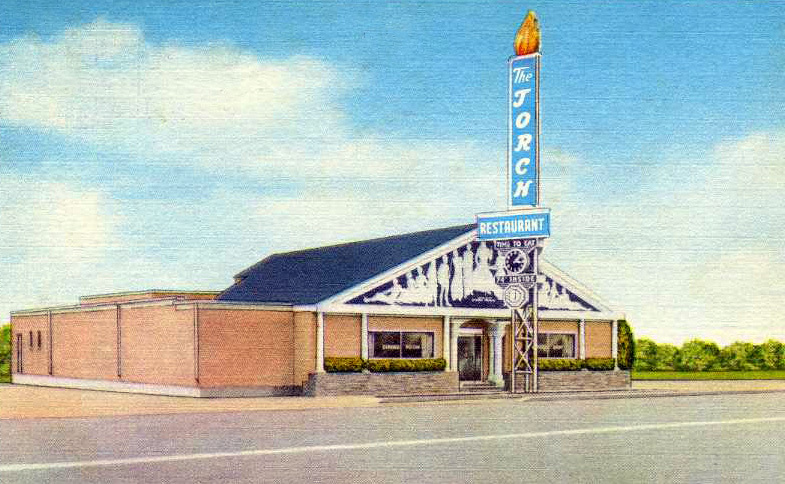 Baltimore Lunches shared many features in common with the fast food chains that arrived in the 1960s. Their offerings were simple and inexpensive. No alcohol was served. Customers got their food at a counter and carried it to their seats. Seating – one-armed wooden chairs — was uncomfortable and did not encourage lingering. Patrons didn’t mind, though, because they were interested in expediting the entire getting and eating process so they could go about their business. 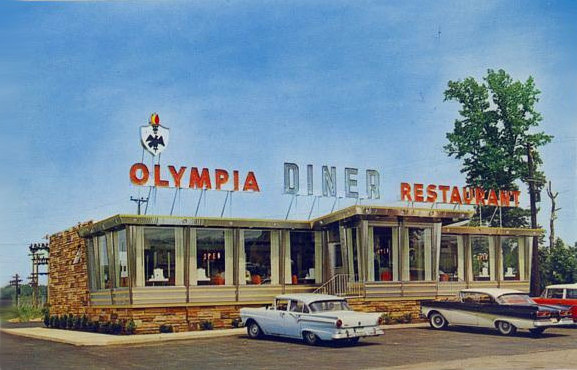 Unlike fast food architecture of the 1960s, though, Baltimore Lunches were built as solidly and luxuriously as Grecian temples. Interiors used marble lavishly for counters and fixtures. Was it because both Whitcomb and Bowles were natives of Vermont, the state where so much marble is quarried? Maybe, but I think that marble was an expression of cleanliness and investment in a growing economy’s ability to efficiently mass produce affordable, nutritious meals. A standard feature of the Baltimore Lunch – a large marble bowl filled with sugar set on a marble pedestal — can easily be seen as a representation of democratic abundance. In most towns and cities across the USA the landscape is filled with fast food eateries that belong to chains, McDonald’s obviously being only one. Chain restaurants make up close to half of all restaurants today, and many of them can be classed as fast food places. A large proportion of the meals people eat away from home come from this type of eating place. Where did people grab a quick bite before the fast food chains came along? 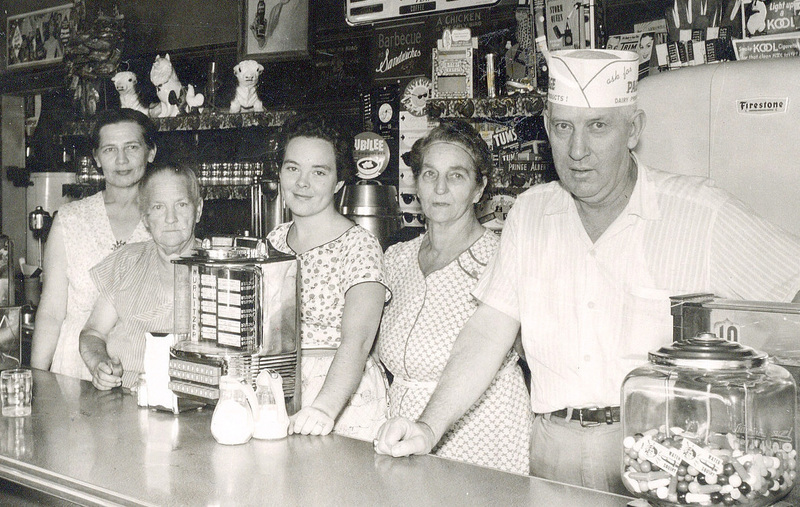 What was the ordinary, inexpensive eating place like for so much of the last century, B.McD.? Let’s peer back into the first half of the 20th century. 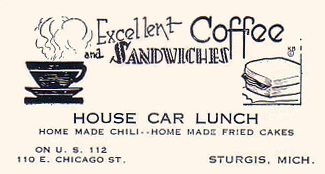 There were some “quick lunch” chains in existence, but they were the exception rather than the rule. 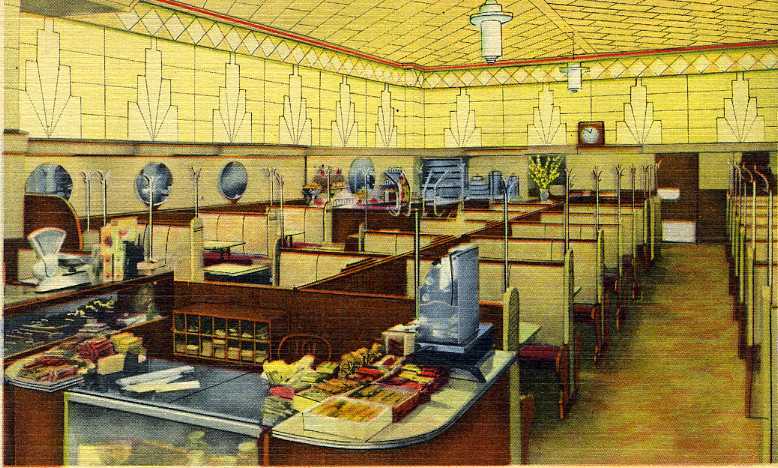 Although high-traffic locations in larger cities were quickly grabbed up by chains such as Baltimore Lunch or John R. Thompson, less desirable sites in cities and on Main Streets in smaller towns were populated with small independent eateries. 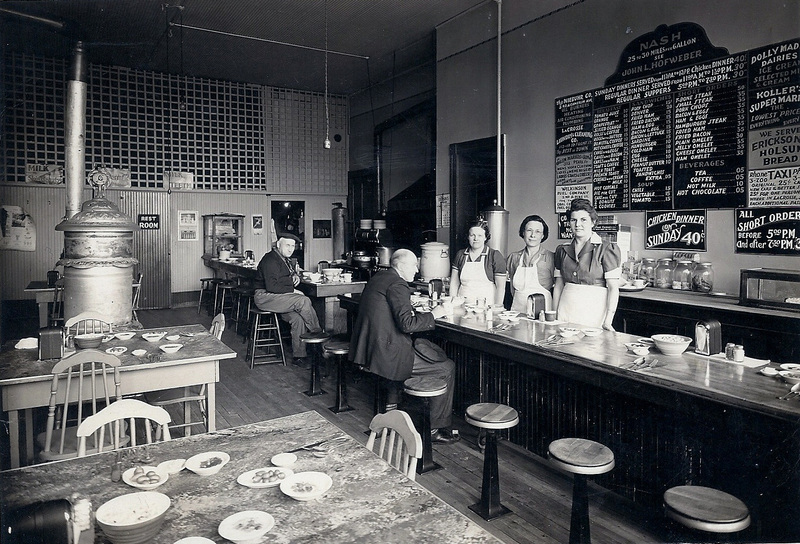 Many, perhaps most, lunch rooms and cafes – not likely to be called restaurants then – occupied storefronts or freestanding one-story buildings of very basic construction. 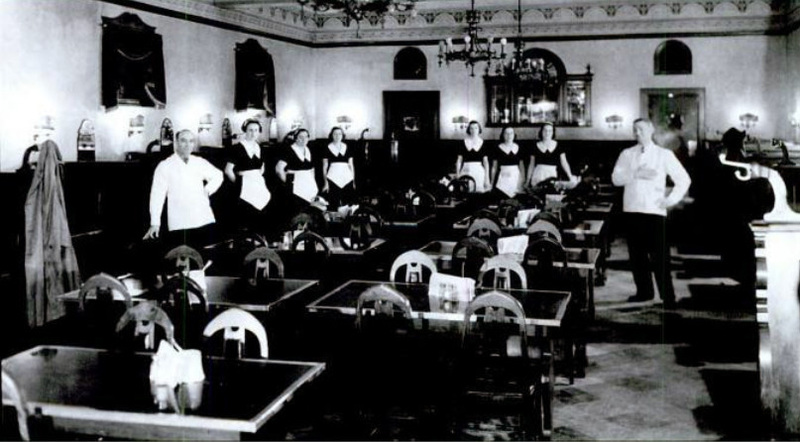 Often they were “mom & pop” operations with one of the pair handling the cooking, the other running the food service side of things. Very likely the proprietors knew most of their customers on at least a first name basis. 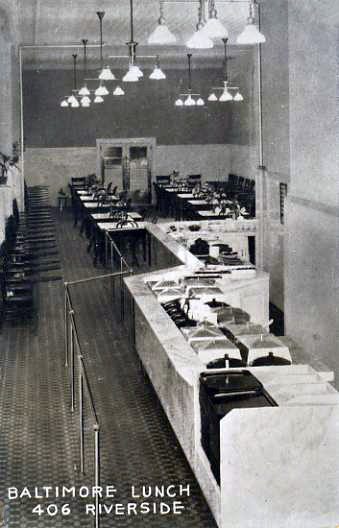 Most lunch rooms shared a basic floor plan in a standard storefront space 18 to 25 feet wide and 75 to 100 feet deep. About 2/3 to 3/4 of the space was devoted to the dining room, the rest making up the kitchen which was hidden behind a wall, partition, or just a curtain. Usually seating would include both a counter and some tables or booths along the side or arranged toward the back. Very narrow storefronts had counter seating only. Shelves behind the counter or glass display cases might hold baked goods, packaged groceries, cigars, or candy. 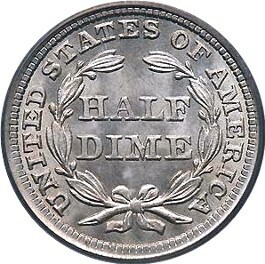 A cash register was often a prominent feature. 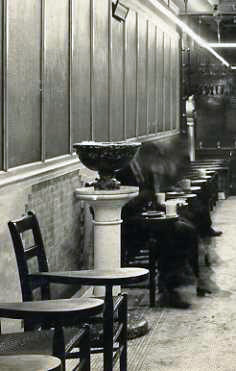 In many cases during Prohibition, a café’s or lunch room’s previous status as a barroom was plainly evident. Decor, such as it was, was frequently provided by posters and stand-up signs advertising national brands, particularly soft drinks. What was gained and what was lost when the old lunch rooms disappeared? It’s a mixed picture. I doubt that their food was much to brag about. Some were clean, some were dirty. 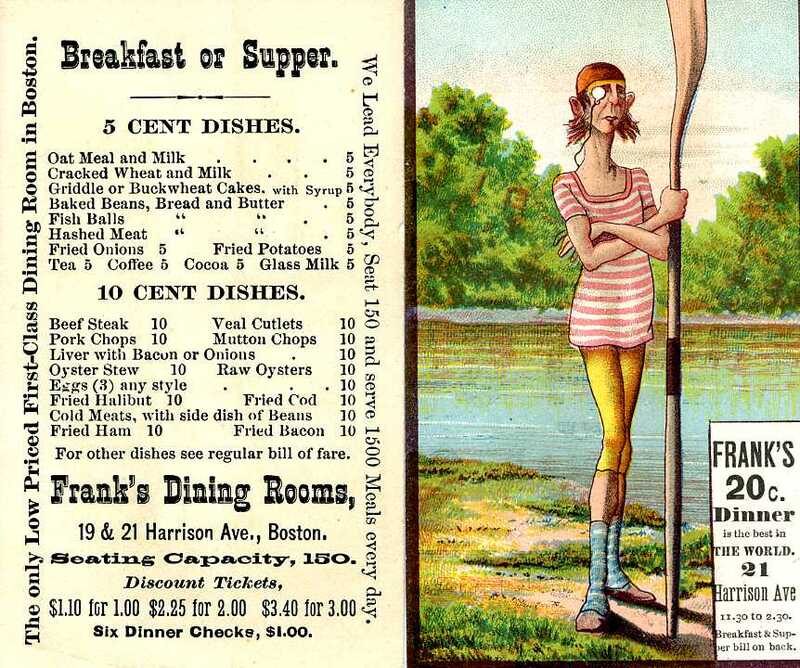 Often their menus were limited — but rarely as limited as the fast food chains. Food was served on dishes, not in paper wrappings. They provided service and often friendliness and a sense of community, though it was sometimes circumscribed by race, gender, and familiarity. I recall walking into a local café in Hannibal MO about ten years ago. The few customers at the counter all turned to stare openly as we came though the door. The proprietor screeched, “Where are YOU from?” We were horrified when the chili came with a big scoop of sour cream on top. She seemed offended when we failed to order pie. I hate to admit it but, all in all, I would have preferred the anonymity of a chain for lunch that day. On the other hand, if we had gone to a chain I wouldn’t remember being in Hannibal at all. It is always a big deal to me when I find a restaurant proprietor’s memoir, all the more so when he or she conducted an “everyday” sort of restaurant. My Ninety-Five Year Journey, privately published by Charles N. Sarris in 1987, was a just such a wonderful, and rare, find. 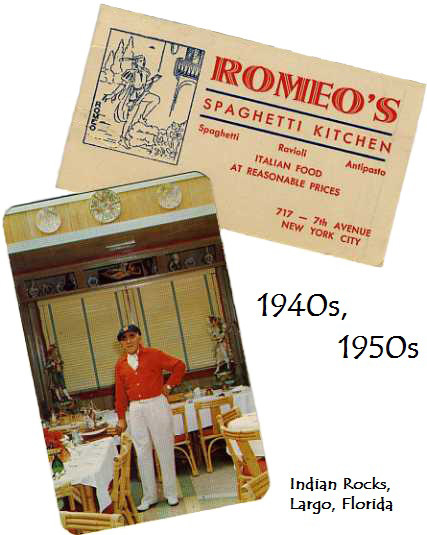 The book illustrates a fairly typical restaurant career for thousands of Greek-Americans who opened restaurants in small towns which had few eating places in the early decades of the 20th century. Charles was born in Lesbos, Greece, in 1891. At 19 he lived in dread that any moment he would be conscripted into the Turkish army and, possibly, spend the rest of his life in an occupied country. He decided to leave for the U.S. For the next six years he bounced around Connecticut and Massachusetts, working in Greek-owned confectioneries where he learned to make candy and ice cream. 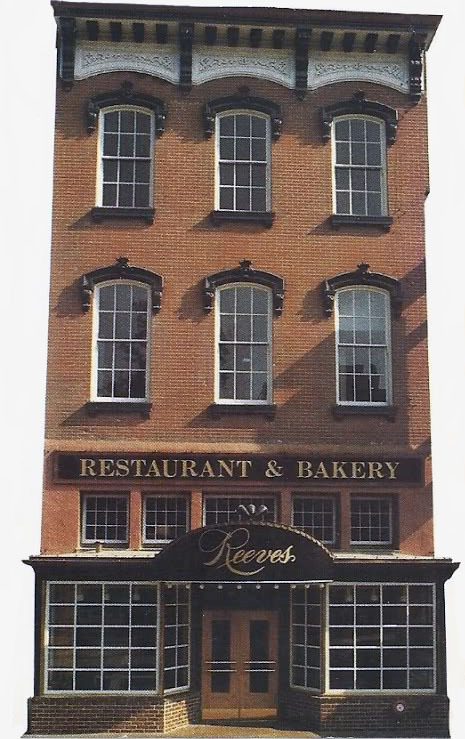 In 1916 he went to work in a new confectionery in Amherst MA, population 5,500. 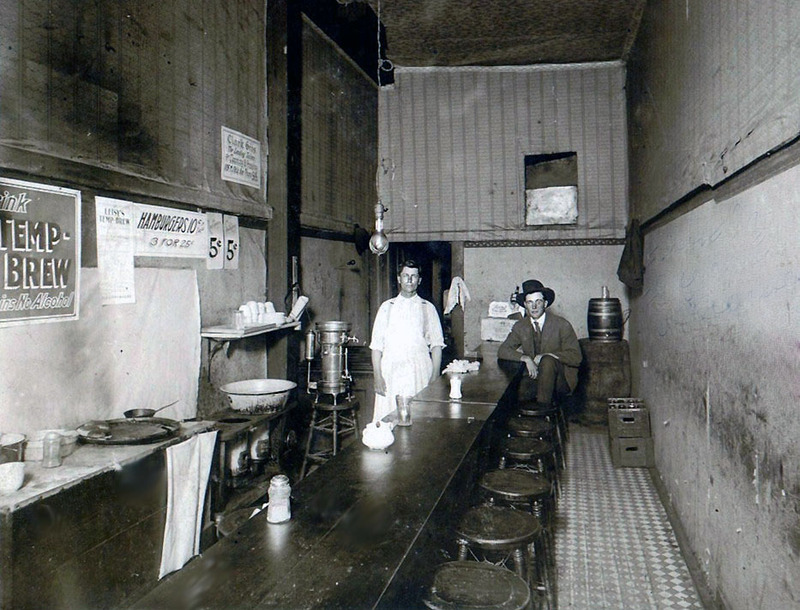 It wasn’t long before Charles and his partners, who included his brother James, took over the confectionery and expanded it into a lunchroom serving basic fare such as hamburgers and ham and eggs. 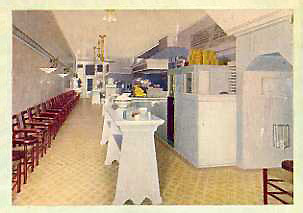 The restaurant was named the College Candy Kitchen [1921 advertisement pictured], obviously aimed at student patrons from Amherst College and the Massachusetts Agricultural College (now the University of Massachusetts). 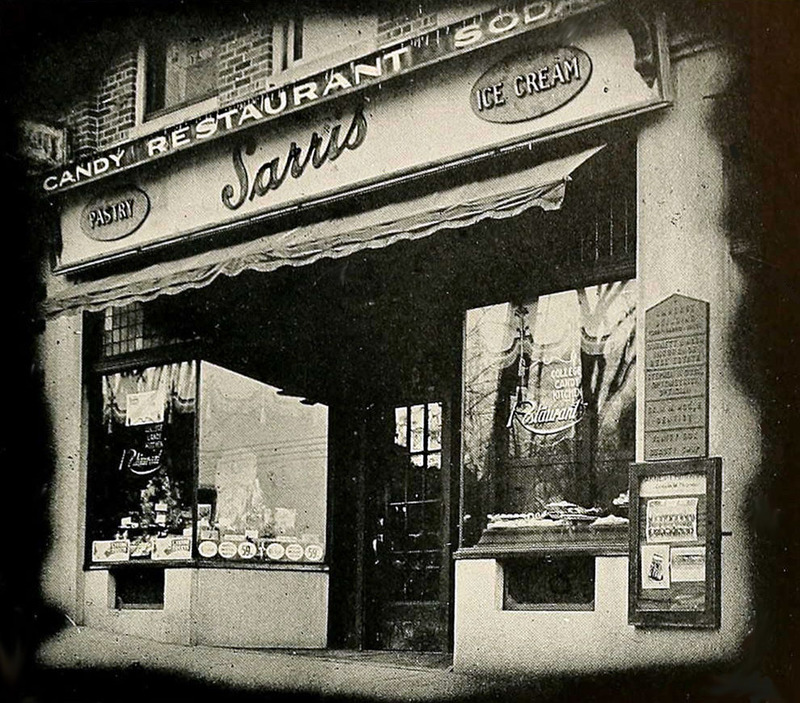 Candy Kitchens run by Greek entrepreneurs could be found throughout the United States in the early 20th century. Coincidentally, another “College Candy Kitchen” did business in Cambridge’s Harvard Square. One of only three Greeks in Amherst when he arrived, Charles would not feel welcome in his new home for some time. He heard racial and ethnic slurs unfamiliar to him from his previous residency in Andover MA. He observed that many townspeople valued people from France, Germany, or England more highly than those from Italy, Poland, the Middle East, or Greece. In 1927 he and two other merchants who occupied the three-story building located on Main Street across from Amherst town hall formed Amherst Realty Co. to buy the property. 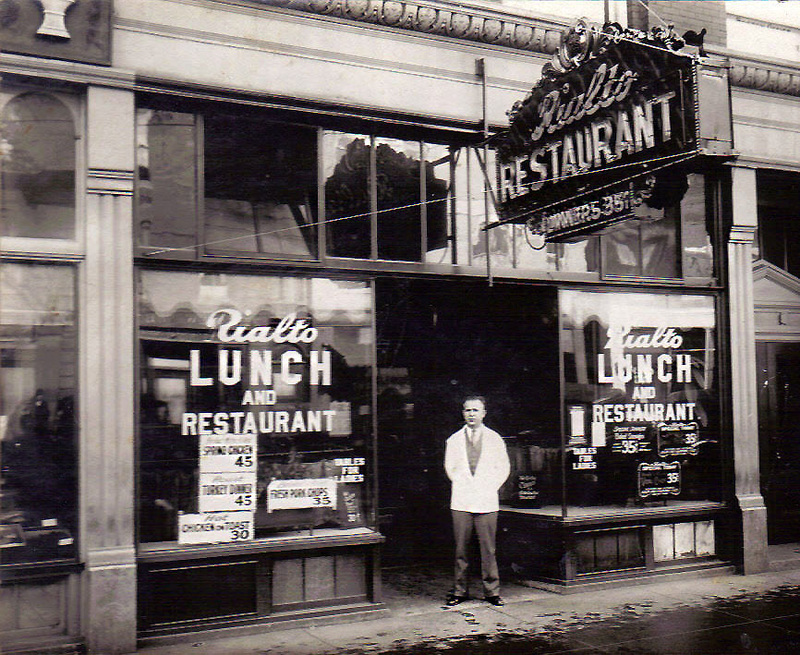 Yet not until 1939, after running a thriving restaurant for 23 years, did Charles finally gain admission into one of the town’s fraternal organizations, the Rotary Club. 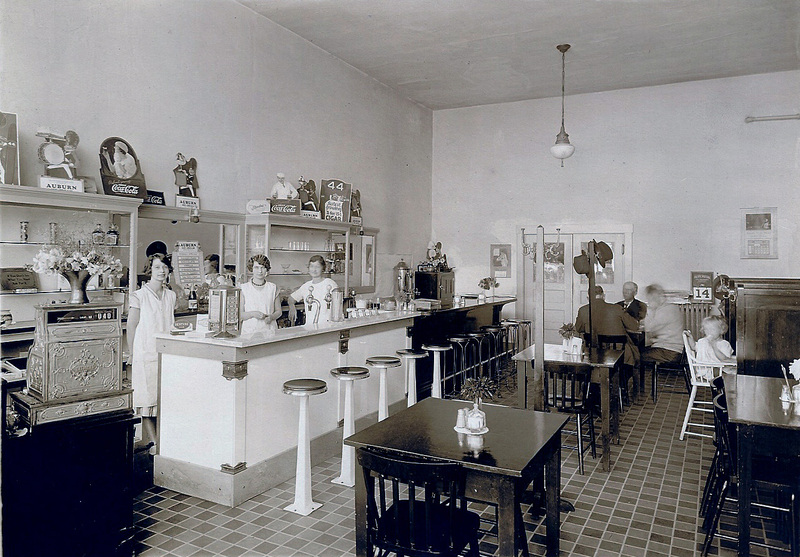 The College Candy Kitchen modernized and expanded in the 1920s [1920s Spanish-style interior shown], despite a disastrous fire in 1928 which necessitated moving to a new location for several months. 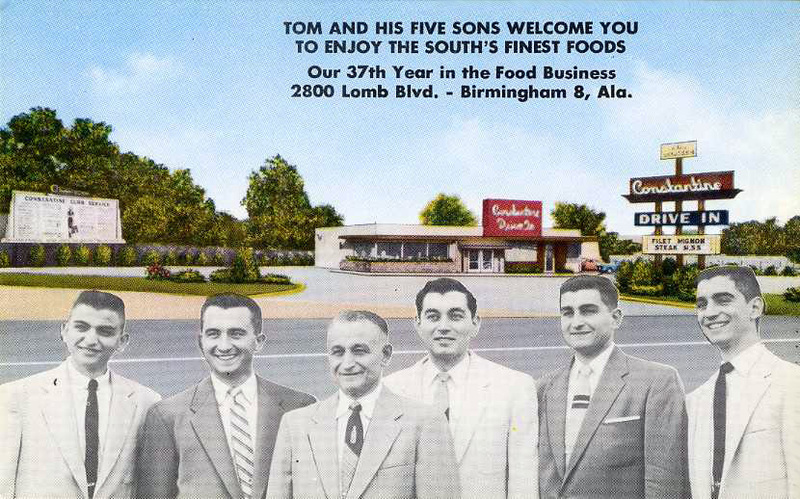 Business slowed drastically but Charles and James got through the Depression ok.
Students, who made up the bulk of customers, balked when the restaurant introduced new foods such as yogurt and melons. 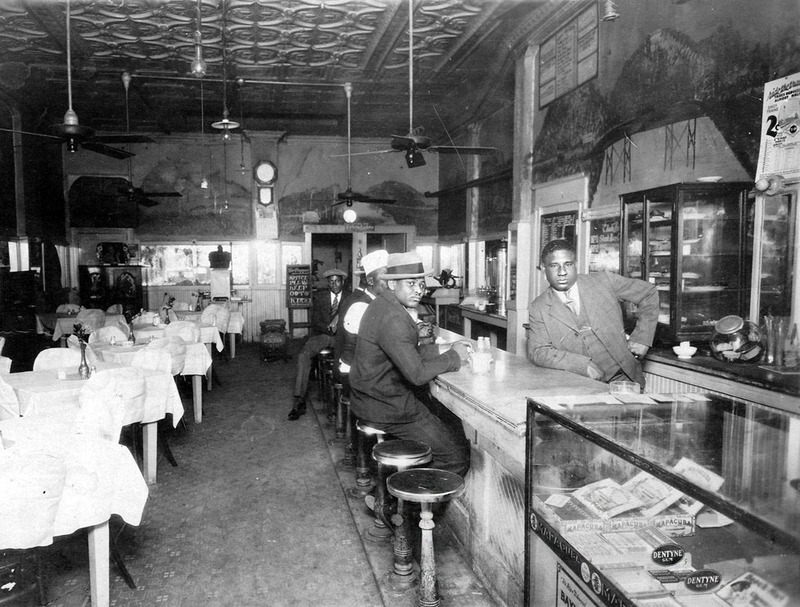 Some greeted watermelon with the objection, “Gee, we’re not Alabama Negroes!” Charles reassured them that the menu would always include staples such as boiled dinners, baked beans, and meatloaf. 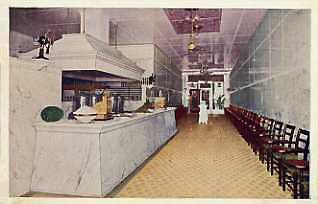 For decades the restaurant continued to produce its own baked goods, ice cream, and, for holidays, candy. Once again Charles encountered customer resistance when he hired Afro-Americans as staff or served them as patrons. “We had a lot of opposition from the students but we ignored it,” he wrote. Eventually they settled down and got used to it. According to Charles, the restaurant closed in 1953 due to illness, parking problems, and customers’ demands for alcoholic beverages (which he did not wish to deal in). It was succeeded by the Town House Restaurant. A 1953 bankruptcy auction notice gave a fair idea of the size of the restaurant then. 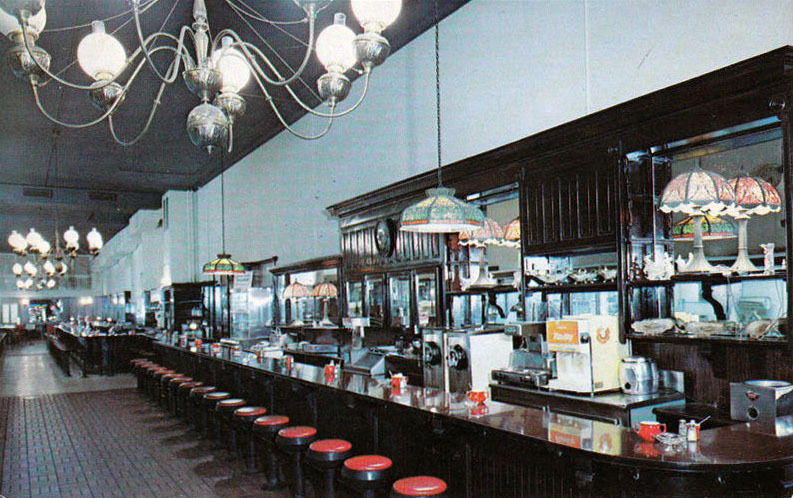 On the auction block were 30 leather upholstered booths, two circular booths, four showcases, a soda fountain with 12 stools, and kitchen, bakery, and ice cream equipment. I can just picture it.